← Boston University Try-A-Tri: Super Sprint Indoor Race! I stumbled across this quote on the wall of the iLab last week while working on some YoungTri projects. 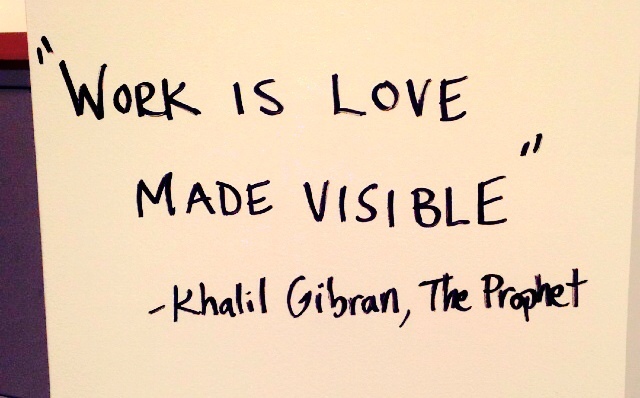 While short, it carries a great deal of meaning — work is love. Putting time, effort, and passion into your work (for the purpose of triathlon, training) — rather than stress, dread, and negativity — increases productivity, results, and happiness. This especially applies to training. When we train with our hearts — with everything we have; down to the core with passion, focus, and excitement, we often see much better results than if we are constantly dreading workouts or focusing on the negative aspects of each workout. The most successful athletes — especially triathletes — pour their heart into their work (training). If you’re stuck in a workout rut, find yourself beating yourself up over training results — or even if things are going well lately workout wise — give today’s workout some extra heart. Whether it’s finding inspiration from a touching story, challenging yourself to run that extra mile or pedal up that hill just a little bit faster or otherwise, small changes can lead to increased satisfaction, happiness, and drive in your training. How do YOU train with heart? Beautiful and profound. Thanks! I really needed to”hear” this.